Two things can happen when we start a family. We can feel the deep connection and compassion for other parents across the world, or we can become tribal, fearful, and protective. Usually, it’s a combination of both. I still remember the incredible love I felt not just toward my son, Leo, after he was born, but also toward everyone we encountered those first few weeks. Maybe it was the oxytocin flowing, but colors seemed brighter and birds sang more beautifully as I wandered about the world, grinning dopily at strangers. But then, one afternoon, when a car didn’t stop at a crosswalk to let us pass, I experienced a blast of self-righteous indignation toward the driver that I’d never before experienced. The same summer Leo was born, a new war ravaged yet another distant part of the world. The anguish on the faces of the parents as they searched rubble for their missing children was more immediate and acute to me than ever before. It occurred to me that those who were dropping bombs on cities surely felt that they were doing what they had to do to keep their own children safe. Becoming a parent helped me realize that underneath all of our differences, all creatures want more than anything to keep their families safe from harm. But how quickly the warmth and compassion we have for our children switches to fear and hatred of the other. That’s what oxytocin is all about — at the same time that it’s associated with feelings of love and connection, it also relates to our experiences of jealousy, protection, and possessiveness — that ‘mama bear’ or ‘papa bear’ response. If there are, indeed, two sides of love, this is about fostering the bright, hopeful, positive side through deliberate practices of lovingkindness (as opposed to lovingfear or lovinganger), knowing that fear, anger, and hatred will never be defeated with more of the same. When we meet suffering, we’re hardwired for a fight-or-flight response (which includes freezing and forget it reactions). Over time, these can lead to anger, avoidance, anxiety, or depression. Although these strong emotions can energize us into action, they just as often lead to us turning away from the suffering we meet in the world. When our greatest spiritual leaders first encountered suffering, however, it sparked a compassionate drive in them to free themselves and all others. No matter our conditioning, rather than turning away, we can all turn toward suffering through the practices of mindfulness and compassion in a process that psychologist Shelley Taylor calls ‘tending and befriending’. According to some Buddhist teachings, lovingkindness refers to the wish for all sentient beings—including our children’s other caregivers — and the natural world around them to experience happiness. Compassion, on the other hand, refers to the desire that all other creatures be free from suffering. Like every tradition’s variation on the Golden Rule, compassion essentially means treating others — strangers and friends — how we want them to treat us. 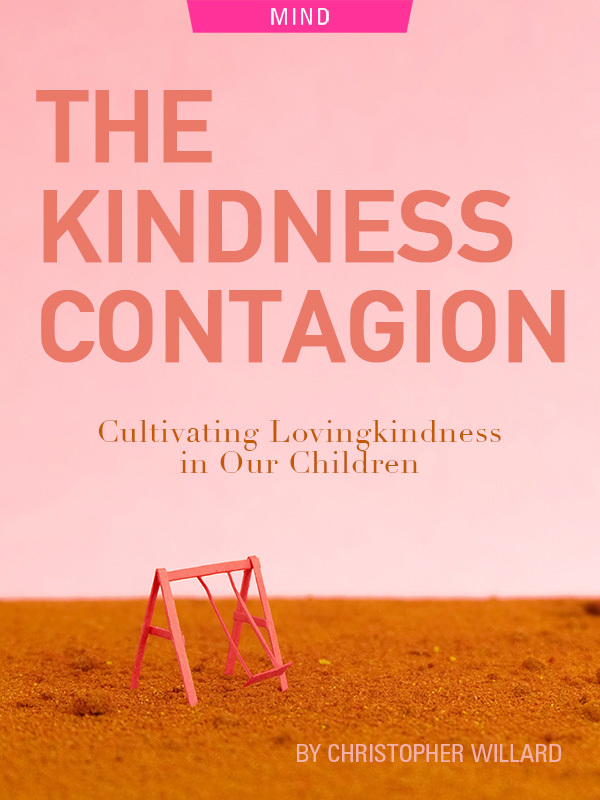 The important point I want to convey is that, whether we call it lovingkindness or compassion, these are qualities that Eastern philosophy and Western science agree we can cultivate in ourselves and our children with practice. They also agree that compassion training makes us happier, healthier, more productive, and — not surprisingly — more popular. Compassion-trained toddlers are more apt to share their stickers, be more flexible, delay gratification, and exhibit stronger scores on measures of executive functions. Some Eastern traditions teach that this change begins with ourselves. Putting ourselves first may feel a little strange to many of us. However, caring for yourself is caring for your child, because it all starts with us. This is where self-compassion enters the picture, especially for parents. We all make mistakes. We all fall short of being the parent we thought we would or should be. There are moments when I hate myself after losing my cool, and I regularly reserve my most creative insults for myself when I forget to pack Leo’s snack or monkey. Unfortunately, self-hatred isn’t known for its ability to overcome self-hatred, which is why self-compassion is so powerful. Forgiveness begins with ourselves. Self-forgiveness and self-compassion do not make us weak or selfish, nor do they indicate that we have lowered our standards. In fact, research repeatedly indicates that they make us more resilient in the face of challenges, more willing to compromise and apologize, and more compassionate toward others. Even when we hold dark secrets and nearly unbearable regrets, we can still learn to practice lovingkindness, compassion, and forgiveness for ourselves. Personally, practicing self-compassion has helped me develop more compassion not just for myself, but for others as well — including my own kids and parents. (As one particularly wise teen I see in my practice recently remarked, “My parents get the angriest with me when I make the same mistakes they did at my age.”) Having compassion for my own mistakes as a parent has helped me have more compassion for my own parents. As the old joke goes, “I used to be the best parent in the world until I had my own kids.” Becoming more compassionate for ourselves also builds resilience, equanimity, and determination — all qualities we want to foster in our children. How better to do this than to embody them ourselves? Take a moment to sit comfortably and allow your eyes to close. Bring to mind a difficult situation in your parenting over the past few weeks — not too big, just something relatively small. What is the scene? Who was there? What were they saying or doing? Take a moment for the image to become clear. Then bring your awareness to all the sensations, emotions, thoughts, and judgments that come to you right now in the moment. Take a few breaths. Then place a hand on your heart, cheek, or arm. Using your own name, say to yourself, “This is hard. This is a moment of suffering. I work to be a good parent, and I may not be perfect, but I am a good-enough parent.” Use whatever words work for you. Take a few more moments to breathe and feel the sensations, noticing any shift in your physical or emotional experience. Finally, remind yourself in some way that all parents struggle. We all fall short of who we wish to be. We all make mistakes. That’s what makes us human, and that’s what connects us as parents. We all struggle and suffer in similar ways. Take a few more breaths as you reflect on this. Then allow your eyes to open. Practice this act of self-compassion whenever you feel the need for forgiveness and kindness — it works! The author’s recent book. Click to view on Amazon. 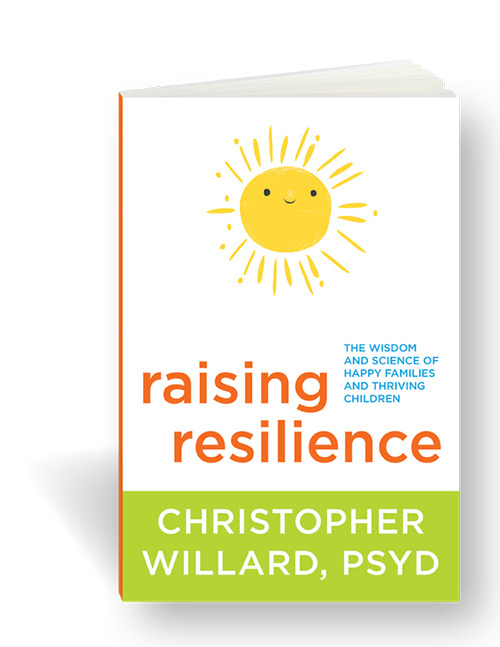 Christopher Willard, PsyD, is the author of Raising Resilience: The Wisdom and Science of Happy Families and Thriving Children (Sounds True, October 2017). For more, visit drchristopherwillard.com.